CAPE CANAVERAL, Fla. — After several delays since its originally planned April 6, 2018, launch date, a SpaceX Falcon 9 rocket lost no time in the early morning hours of June 4, 2018, lifting off from Cape Canaveral Air Force Station’s Space Launch Complex 40 at 12:45 a.m. EDT (04:45 UTC). Within minutes of the opening of the launch window. 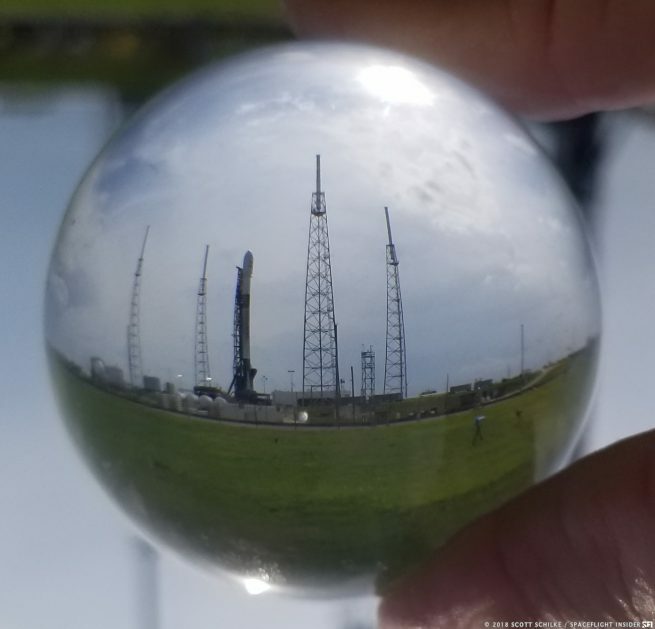 A four-hour launch window had been planned in case of unfavorable weather conditions, but the storms that covered Central Florida cleared to allow the rocket’s flight to get underway. Cheers erupted from both the California-based and Cape Canaveral SpaceX employees, as well as from crowds watching the launch, as one by one the launch milestones, lift-off, first-stage separation, second stage ignition, completion of the second stage burns, fairing deployment, and finally spacecraft deployment – were all completed “nominally” as if being read from the SpaceX playbook. The Block 4 rocket’s first stage booster with its nine Merlin 1D engines had previously ferried the OTV-5 mission aloft in September of 2017, thus reaching its two-mission design life, and the booster consequently was not planned to be retrieved. However, the two-piece fairing that protected the satellite during its ascent through Earth’s atmosphere was planned to be recovered, though this had not been confirmed as of the writing of this report. As planned, the first stage burned for about two-and-a-half minutes before being jettisoned into the Atlantic Ocean far below. The second stage, a Block 5 design, had two burns: an initial six minute burn, followed by a 17-minute coast, and finally a second burn about 1 minute in duration. Following the release of the protective fairing, the gold-clad satellite was gently released from the second stage into its geostationary transfer orbit (GTO), about 32 minutes after lift-off. Over the next few months, the satellite will be maneuvered into its permanent geostationary orbit using its own internal electric-powered thrusters. It will join the SES-8 satellite into position roughly 22,000 miles (35,406 kilometers) over the equator at 95 East longitude. SES-12 is expected to become fully operational in the January-February 2019 timeframe, once the satellite reaches its final orbital position and its many internal systems have been activated and tested. Interestingly, SES Chief Technical Officer (CTO) Martin Halliwell had revealed in a media briefing a few days earlier that the nature of the satellite’s initial geostationary transfer orbit is expected to significantly increase the satellite’s useful life from about 15 years to perhaps as long as 22 years. 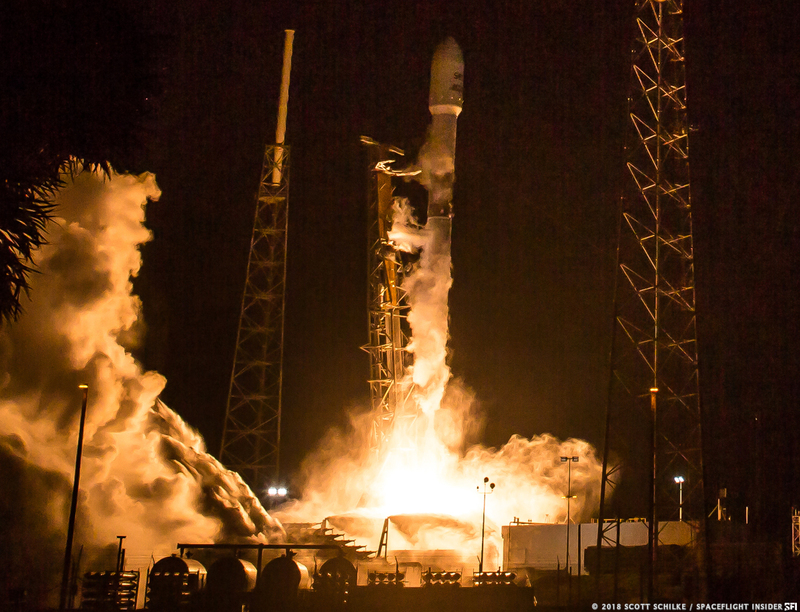 Coincidentally, the June 4 launch of SES-12 also marked the eighth anniversary date of the flight of the first Falcon 9 rocket, also from SLC-40. on June 4. 2010. For SES, a firm customer of the Launch Service Provider, the deployment of this spacecraft meant that it would be able to provide a greater range of services. “More content. More immersive viewing experience. Blazing internet speeds. Reliable cell coverage. All of these dynamic customer requirements can now be met with the successful launch of SES-12, which will provide incremental high performance capacity and offer greater reliability and flexibility to our customers,” said SES‘ Chief Technology Officer Martin Halliwell.